This lively lady has invited the Free Range Chix, a local trio, to sing at her 99th birthday party next month. She’s a regular supporter of music and the arts, having helped to establish the Southern Illinois Chamber Music Society, and funding the SIU School of Music’s first cash prize for student composers, named for her uncle, Carl Deis, a musician in his own right. 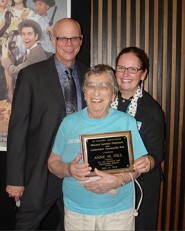 After Anne Hill retired from SIU in 1981, she continued her active membership in several local community organizations. Hill, a 1986 SIU English alumna, wrote and circulated newsletters for three separate organization over 12 years. She served on the WSIU Friends Board and was a contributor in converting WSIU-TV to a digital broadcast, and provided funding for essential purchases for Morris Library and Carbondale Public Library. Hill is making sure these programs enjoy longstanding support. When she sold her house recently, Hill put the majority of the proceeds in a charitable gift annuity through the SIU Foundation. Her gift will provide funds for WSIU Public Broadcasting, McLeod Theater Playhouse, SIU’s Chamber Music Society and Carl Deis Composer Prize in addition to student scholarships. She envisions this option as a way to continue her major support of music and the arts in addition to receiving some additional income. Her charitable gift annuity contract with the SIU Foundation provides Hill with a charitable income tax deduction as well as an income stream for life. Hill, who now lives in a Carbondale retirement village, says she gathered home improvement concepts from “This Old House,” a popular program on WSIU-TV. She is also a loyal listener to classical music on WSIU radio and is mentioned on air as one of the Leadership Circle. Her residence features art she has collected over the years, and she is making plans to donate her art to the University Museum. Hill’s family has been deeply rooted in music for generations. Hill enjoys her retirement home residence and doesn’t appear to be slowing down anytime soon. “I can’t drive anymore due to macular degeneration. People who drive are still in the real world,” she says. “My real world is interacting with people of all ages and interests in diverse organizations in which I have been a member. I want to encourage everyone in the village to be active, too. I have plans to keep myself busy. If you are interested in learning more about a charitable gift annuity, please call Director of Development Pat Moline at 618/453-4947 or visit our website at: www.siufgiving.org.